A quick, simple meal when you want comfort food. My mom used to make this all the time when I was a kid and its one of my dad's favorite meals served with some warm garlic bread. You can make this with ground turkey or chicken as well. Brown ground beef with garlic. Meanwhile heat water for egg noodles, salt the water and cook noodles approx 6 minutes until al dente. 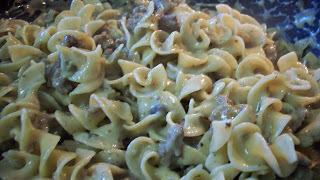 When beef is browned, turn heat to low and add cream of mushroom soup, velveeta, and milk. Add onion powder, paprika, salt and pepper and the drained egg noodles. Stir to combine. Add shredded cheese and stir until melted. Let it simmer a few minutes to thicken the sauce if necessary. Top with chives and parsley and serve.